1892 Thomas Crowley creates a new enterprise with a Whitehall rowboat (18-20 feet long), which became the first official “bay cruise” boat on the San Francisco Bay. 1895 The bay cruise business is incorporated under the name “Thomas Crowley and Brothers”. 1900 Originally known as “Meigg’s Wharf,” this year officially marks the neighborhood as “Fisherman’s Wharf”. 1901 Crowley adds gas launch boats “Crowley” and “Spy” to the fleet. 1903 Two more gas launch boats “Scout” and “Chief” added to the fleet. 1904 Crowley wins the annual Fourth of July Whitehall Boat race. 1905 Two more gas launch boats “Comet” and “Meteor” added to the fleet. 1914 Crowley builds two “double decker” 250-passenger vessels (Crowley #17 and Crowley #18) for participation in the Pan Pacific Worlds Fair Exposition (1915). 1922 British Fleet anchored in the San Francisco bay with Crowley providing ferry service to passengers. 1930-1933 Crowley introduces high-speed “water taxi” vessels, providing excursions for passengers to view the British battleship HMS Hood. 1934 United States officially takes over Alcatraz as federal prison. 1936 San Francisco-Oakland Bay Bridge completed. 1937 Golden Gate Bridge completed. 1939 Golden Gate International Exposition takes place on Treasure Island, a celebration of the opening of San Francisco’s two bridges. World War II begins. 1940 Crowley builds numerous vessels to accommodate local demand for transportation during the war. 1945 Conversion of the water taxis to passenger vessels from Pier 16. Crowley transfers his holdings into new company: Red and White Fleet. 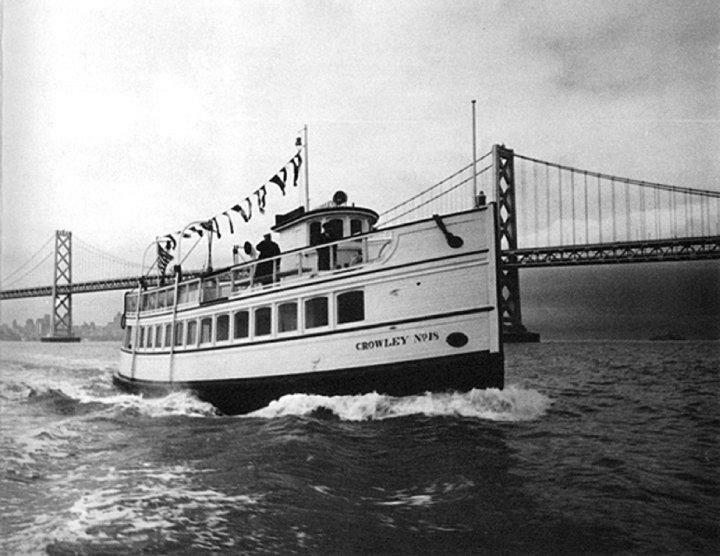 1946 Red and White Fleet purchases passenger vessel General Frank M Coxe and begins service to Angel Island. 1948 Red and White Fleet builds two sightseeing vessels, “Harbor Sightseer” and “Harbor Tourist” and begins ferry service between Oakland and Alameda Naval Air Station. 1949 Red and White Fleet begins sightseeing cruises from Fisherman’s Wharf . 1954 Red and White Fleet builds 400 passenger “Harbor King”. 1955 Historic Balclutha ties up at Pier 43 as museum. 1956-1957 Red and White Fleet two 400 passenger vessels, “Harbor Queen” and “Harbor Princess”. 1960 Red and White Fleet starts Tiburon ferry service. 1966 Iconic Fisherman’s Wharf sign erected. 1970 Thomas Crowley, founder of the company, dies on August 4. 1973 Red and White Fleet offers service to Alcatraz. 1982 Red and White Fleet starts ferry service between Fisherman’s Wharf and Sausalito. 1984 Red and White Fleet introduces MV CataMarin, first high speed catamaran on the bay. 1989 In the aftermath of the Loma Prieta Earthquake, Red and White Fleet transports 15,000 stranded commuters. 1995 “F” Line historic streetcar service begins along waterfront into Fisherman’s Wharf. 1997 Tom Escher purchases and becomes president of Red and White Fleet. 2010 FDR’s Presidential Yacht, USS Potomac, launches partnership with Red and White Fleet to sell private charters aboard this historic vessel. Book your cruise with Red & White today!